The success of a service can sometimes be measured according to the business activity it is generating around it (think of accessories for Ipod or recently SkyLook). Skype’s success is giving many ideas to imaginative entrepreneurs (the Skype-conomy). Switzerland based Sky-Click is a an interesting idea released by Ads-Click that already launched a white label adwords/adsense-like plateform (used by Wanadoo ISP in Europe) as well as a pay-per-call ad format. 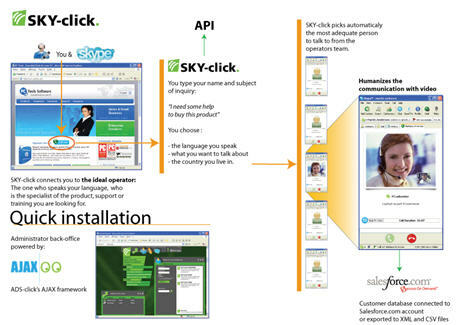 Sky-Click is a 100% web-based solution to set up your call center, built on Skype API and very easy to implement and use. The service does not require any particular hardware investment and can be easily integrated in a web site (e-commerce for example). All you have to do is downloading Skype client on the call-center collaborators’ computer. On the end-user side all you have to do is press the “call” button that will initiate a call (or a video call) to the call-center. It has been designed for any kind of corporations whether big or not. Although I am not sure big guys will be first to rush on that solution , I believe that Sky-Click is quite fine for medium and small size businesses searching to reduce operational costs without compromising on customer care policy. Of course calls are free for end users and for corporations service is much cheaper than any solution available on the market: about 10 USD/ months / collaborator. 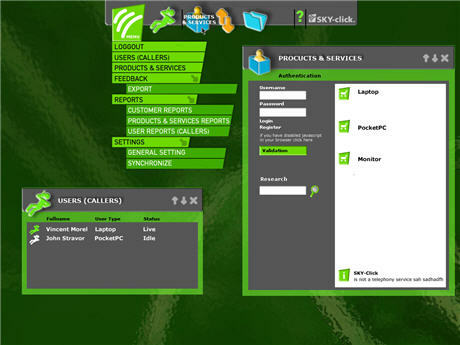 Sky-Click can also be used for other purposes like remote training or sales force management. Pascal Rossini (CEO) and Cyril Lamblard (COO) informed us that Sky-Click should open in a few weeks and in the meantime you can subscribe to their temporary homepage to be alerted on the launch or even write to info (at) sky-click.com.